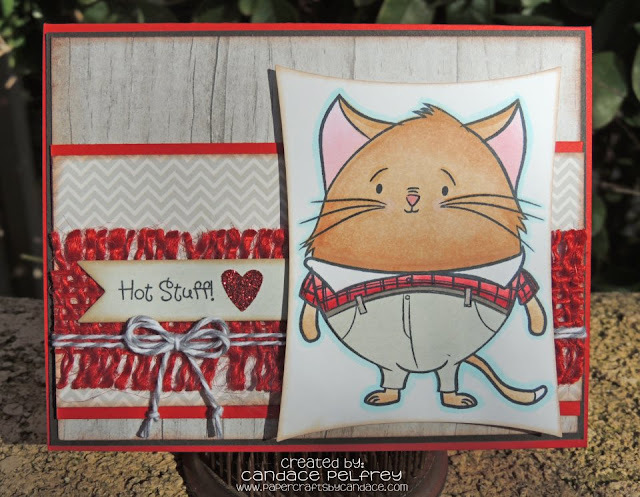 Paper Crafts by Candace: Hot Stuff! So it's not often that I use a stamp or image that isn't Jaded Blossom's but I just COULDN'T pass up this fat cat! He's hilarious and awesome all at the same time. This cute guy is from Stamp Annie Thing and is called "One Cool Cat"
The sentiment is from Jaded Blossom's "Funny Valentine"
that fat cat is too funny!! GREAT card!!! Love it Candace... thanks for sharing....and loving Fat Cat!! I LOVE that fat cat! He is so stinkin cute! That is one COOL cat!!!! love that fat cat so cool.